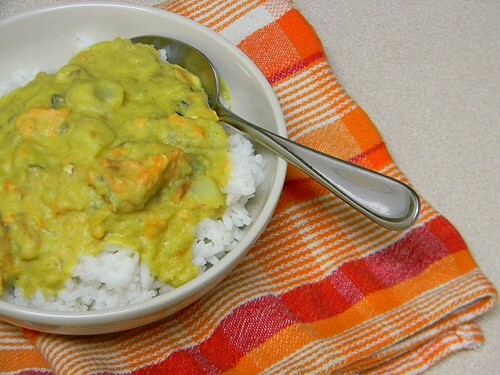 This salmon curry is so simple it’ll blow your mind. 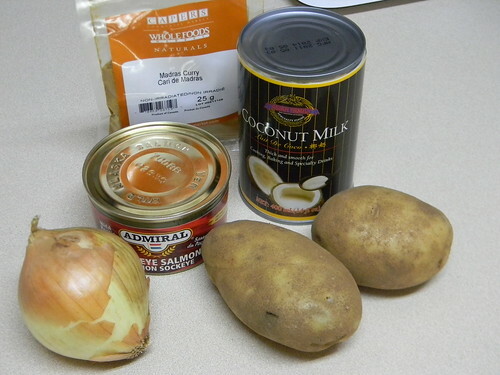 The recipe is from a cookbook, South Sea Island Recipes, and was organized by the Fijian Girl Guides Association and the recipes were sent, to quote, “by the members and friends of the Girl Guides Association, Fiji. It does not aim at being a representative book of cookery, but an aid to the housewives in the South Sea Islands.” This cookbook is what I guess could be considered something of a family heirloom, coming from my Dad’s side of the family. Since it’s a cookbook of recipes compiled from several people, the measurements aren’t uniform: some recipes are volume, using cups and spoons, others give ingredients in weight, and others still use a combination of volume and weight. The recipes are told simply and there aren’t any pictures. Excuse the graininess, taken with my iPod and no filters! 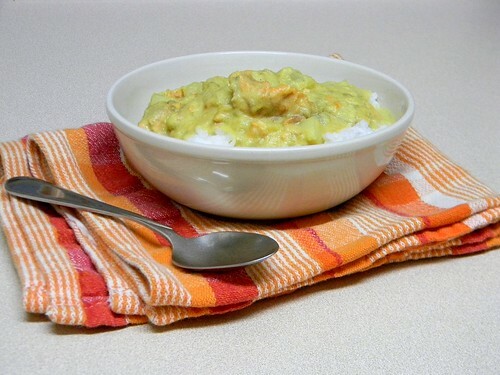 I learned how to make this curry in the early days of when I was learning how to cook. 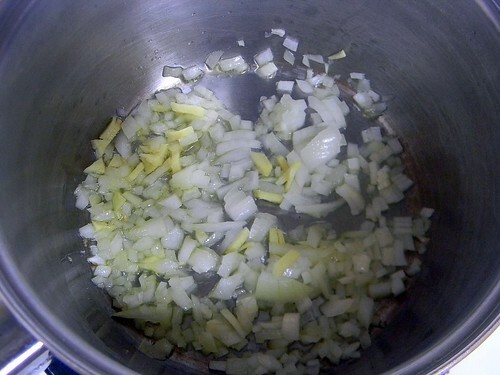 It was also, I remember, the first recipe that I chopped the onion for. (I had previously let my Mum do that, because I didn’t want to get the gas from the onion in my eyes – but, as it turns out, weirdly enough, I’m nearly immune to it. Everyone who knows me and knows this fact calls me lucky.) This cookbook was also the first that freaked me out about ingredients – there’s a recipe in there somewhere that calls for lady fingers and in my childish mind I mistakenly assumed them for human fingers. It took several explanations from different members of my family to realize that the lady fingers in question were the biscuit-y/cake-y kind. 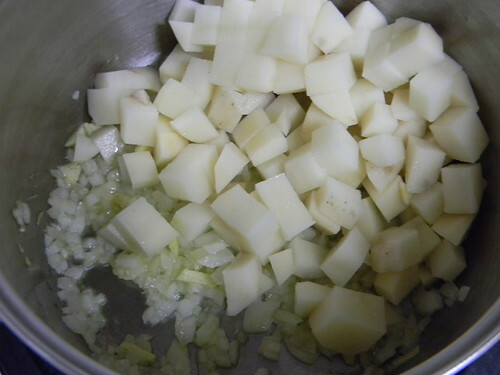 Once the onion is translucent, put in 2 chopped potatoes and stir it around so that the potatoes don’t stick to the bottom. 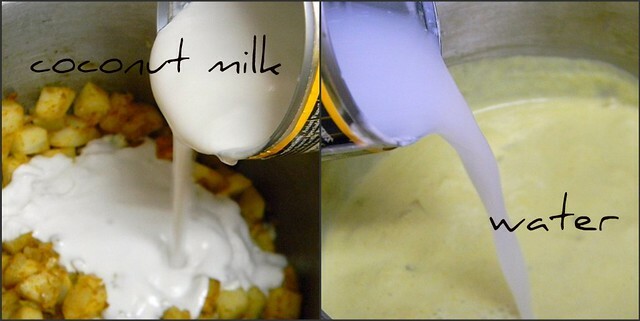 Pour in 1 tin of coconut milk and fill the emptied tin half-full with water, adding to the pot. Stir. 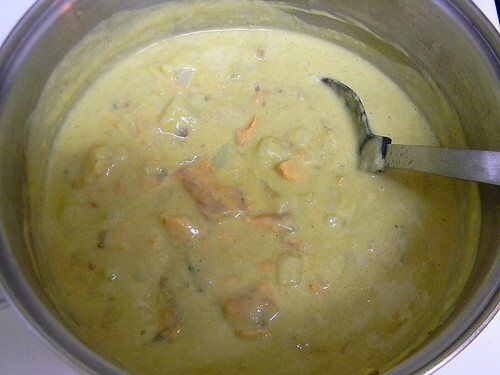 Bring to a boil and lower to medium heat, letting it gently simmer for 20 minutes or until the potatoes have softened. Take the curry off the heat and add 1 tin of salmon. Break the salmon up to distribute through the curry. Serve over fresh cooked rice and enjoy! 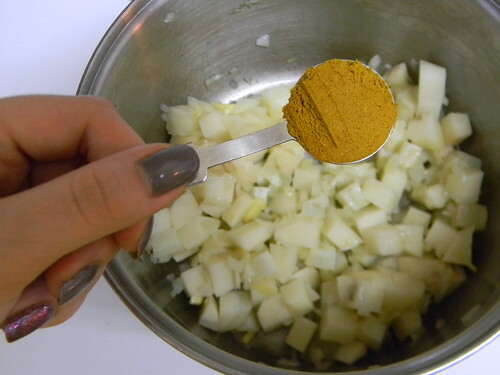 Add the curry powder and brown for about a minute, or add to the potatoes. Pour in coconut milk and fill the coconut milk tin half-full with water and add water. Bring to a boil and lower to medium to medium low heat. Gently simmer for 20 minutes or until potatoes are cooked through and soft. Remove the curry from heat and add the tinned salmon, breaking up to distribute through the curry. Serve over rice and add salt to taste, if desired. Ladies, the reason why onions get to us is because of the capcacin that is released in the membranes of the onion as you gut it. That capcacin (a chemical compound) affects our sinuses as we breathe through our nose. A siomple trick is to breathe through your mouth only (thus cutting the oxygen ‘route’ directly to your lungs and bypassing your sinuses). Singing out loud is a good way of doing this, as anatomically – when you sing – you tend to breathe through your mouth… I guess we know now why so many chef’s tend to sign in their kitchens! I just love little unique recipe books like that. Which reminds me – I have an awesome one I got from a coworker with a bunch of Russian recipes. I need to look at that again. This sounds like a lovely little dish. Hi Alta, thank you! We have it quite often (had it for lunch yesterday, in fact). I’d love to see some of those Russian recipes. Just tried this but I used sweet potato as that’s all I had. Worked out great! I might add some prawns next time. Thanks! Sweet potato is great! I’ve also made it with yam instead of potato. Glad you liked it! Made this last year and really enjoyed it. I will add more curry or find better curry next time I make it. It’s a keeper!